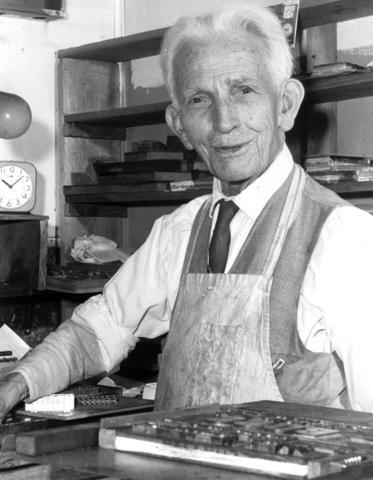 Item is a photograph portrait of Philip T. Timms behind the counter of his printing shop. Donated by Pacific Press, Vancouver BC before 1979. Stamp on centre verso "Province / Photo". Blue marker on verso "[Ph]ilip T. Timms". Green sticker on verso "1967 Photo / PROV. Photo / Date Filed: Aug 27, 1956 / Topic: Timms, Philip T. / Printer - Van"